13 members of the TC in Norway has left their Standards Body in protest. They say that the Standards Body has lost its credibility in the IT area. Remember that Standards Norway was voting Yes with the support of only 2 companies (Microsoft and Statoil), and against the will of the rest of the technical committee. 13 members of the TC in Norway has left their Standards Body in protest. They say that the Standards Body has lost its credibility in the IT area. Remember that Standards Norway was voting Yes with the support of only 2 companies (Microsoft and Statoil), and against the will of the rest of the technical committee (read our previous article "Norway: 21 "No", 2 "Yes" and Microsoft still gets its way?"). Here is also a list of irregularities of the broken Norwegian process. We, the undersigned, are ending our work within Standard Norway. It is sad when organizations that work for our common interest fail the task. Through the OOXML work Standard Norway has shown, with a clear margin, that they are not fit to represent Norway in the ISO. "Standardization of formats for content on the Web is more important than ever. A large part of mankind's communication is done digitally, and all - ALL - must have the ability to read and write these formats," said Håkon Wium Lie. 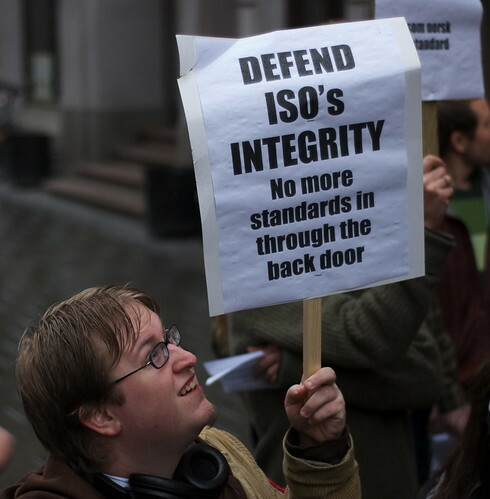 Standard Norway chose to defy their own technical committee and vote yes to a specification that is immature, useless, and unworthy of being called an ISO standard. Standard Norway has lost its credibility in the IT area from the way it has administered the process. Standard Norway has set its own commercial interests ahead of what is best for society, most feasible technologically, and what is professionally advisable. "By participating in a further work in Standard Norway will we lose our professional credibility," said Arne S. Nielsen. Therefore, we have chosen to leave the committee. "Standard Norway has overruled hundreds of thousands of users in the public and private sectors", says Martin Bekkelund. The mass-copied Microsoft-letter did not contain a single professional argument. Standard Norway first said that these kinds of statements would not be given any weight. However, at the end of the process they changed their mind and emphasized the Microsoft letters. Thereby, Standard Norway misled the committee members. The process in Standard Norway is unpredictable, subjective and is continuously changed behind the scenes. "There is no way to appeal a decision, neither inside nor outside Standard Norway — the administrative staff who makes the decisions is the same who 'reviews' (i.e., lingers, ignores and shelves) appeals and complaints", says Trond Heier. Each and every one of use will continue our for better standards within organizations other than Standard Norway. Jachwitz has been handling the case quite inconsistently. In the first SN/K 185 meeting, he demanded full agreement on any comments to be sent to ISO, meaning that the default vote in case one person wouldn't agree on any of the comments would be YES. They seem to have 'pulled a Denmark' (or Singapore too). "37 letters with exactly the same words. Some of the senders didn't even care to remove the 'Type company name here' text. I call it fraud, cheating and disgusting. If I wasn't anti-Microsoft before, I am now. Disgusting !"